The United States is pushing to re-elect the World Bank’s twelfth consecutive American president. Does he deserve another term? Both lending growth and project performance at the Bank appear weak by historical standards, but evaluating a bank with no profit motive is inherently difficult. 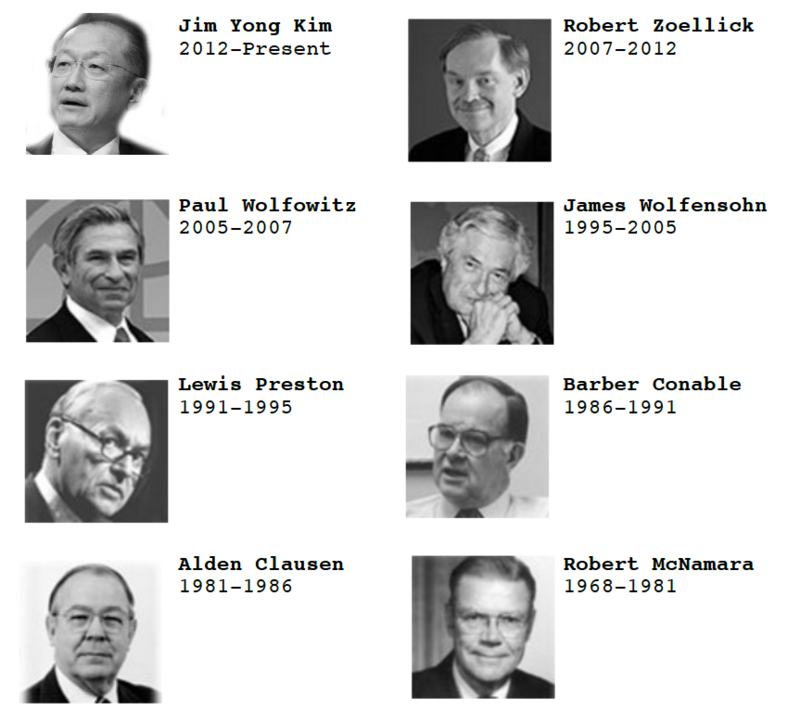 If you talk privately to many World Bank staff members, you're likely to hear accusations that the Bank's current president, Jim Kim, is the worst the institution has ever had—which should be greeted with some skepticism given that list includes one who advocated a return to the gold standard (in 2010!) and another who staked his presidency on stamping out corruption before resigning amidst his own personal corruption scandal. What has Kim done that’s so bad by comparison? The staff's key complaint is that Kim’s signature effort, a chaotic re-structuring of the Bank's organization led by external McKinsey consultants, has dragged on for four years now and is hindering lending operations. Meanwhile, Kim is staking his outsized media image on pet projects like the World Bank's ebola response which, while laudable, accounts for about 1 percent of new Bank lending since he took office. Does the evidence support the allegation that the World Bank’s core work is really suffering? The short answer is maybe, but it turns out to be a hard question to answer. We don't know any of the things we actually care about, like how many people were lifted out of poverty by Bank projects, how many infant deaths or tons of CO2 emissions were averted. The World Bank produces a corporate scorecard that tracks a dizzying array of indicators, but most are either entirely outside the Bank's control (like global GDP) or weren't measured until the last few years, so can't be used to compare Kim to his predecessors. The best we can do over a fairly long time horizon is compare two key indicators of Bank performance: how much the Bank lends for development projects, and how well those projects perform—as assessed by the Bank's own Independent Evaluation Group. Think of them as the quantity and quality of lending. Pushing money out the door is commonly ridiculed in the aid industry. But it's a considerably more informative metric when you're asking people to pay you back. The World Bank is not an aid agency per se, it's a bank. It has to convince borrowers that borrowing from the World Bank is worth the cost and the hassle. Supply must find demand, and the Bank has to offer a valuable service to increase lending. Since the Bank has grown enormously over time, we compare growth rates rather than levels. 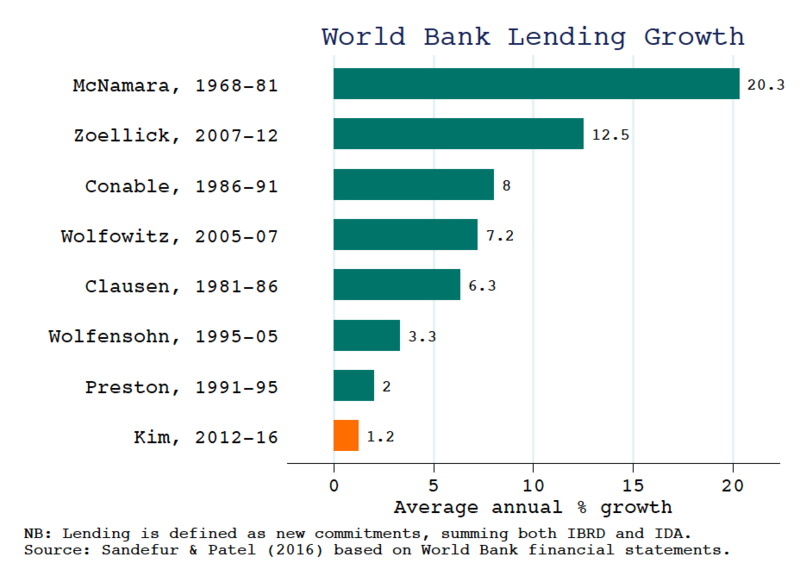 Ranking World Bank presidents by annual lending increases shows that growth is at an all-time low—though as we'll see, that statement is a little unfair to Jim Kim. At the top of the rankings is Robert McNamara, the longest serving Bank president, from 1968 to 1981, who grew lending by upwards of 20 percent per year for 13 years. The runner, Bob Zoellick, runs far behind at 12.5 percent lending growth sustained for five years from 2007 to 2012. 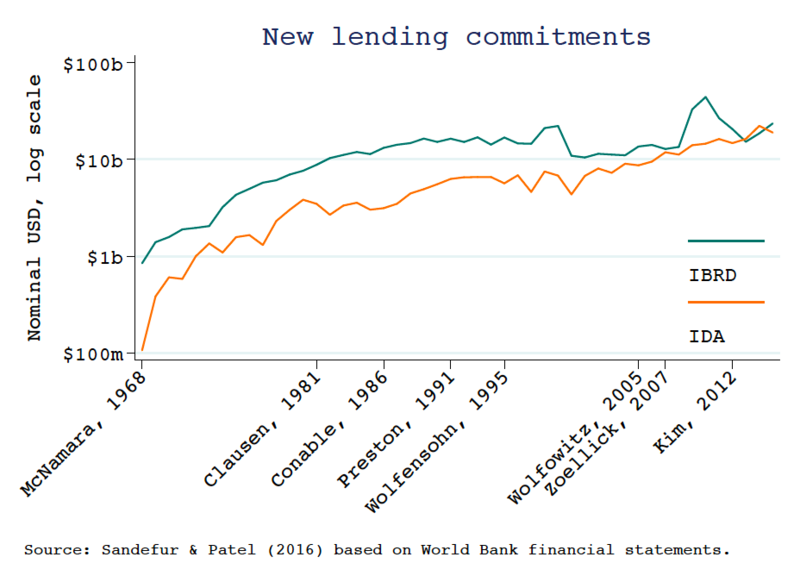 Zoellick's lending boom is an artifact of the global financial crisis of 2008, which drove IBRD lending (the Bank's window for middle-income countries who pay interest and have to repay loans) up from about $13 billion in 2008 to $33 billion in 2009, before declining again in subsequent years. Jim Kim had the misfortune of inheriting a Bank in 2012 that was shrinking after Zoellick’s lending boom. The stats indicate that he hasn't done as much to grow it back up again as some might have hoped. Though new IBRD lending did have a healthy year in 2015, rising from about $19 billion to $24 billion. Not only was Kim’s timing bad, he also faced supply constraints. As with all presidents, the amount of concessional finance that goes through the Bank’s IDA window is capped by contributions. If you take out IDA though, lending growth was still the slowest ever under Kim. But the Bank faced supply constraints on IBRD lending in 2013 as well, due to prudential limits which (while possibly the president’s responsibility) meant slow lending growth didn’t necessarily reflect a lack of demand. How much to weight these caveats is a judgement call. Money isn't everything, even in development finance. It also matters how you spend it. Lacking hard data on the impact of World Bank projects, we (and the Bank's board) are forced to rely on subjective assessments by the Bank's Independent Evaluation Group, which reviews all loans when they close. In brief, while project quality isn't measured well, it doesn't seem to be going super well either. A lot depends on how you slice and dice the evaluation data though. Most World Bank projects span multiple years, and many span multiple presidents. Should projects be attributed to the president who started them, or the president who finished them? We compute both metrics. In either case McNamara looks pretty good. In contrast, Paul Wolfowitz’s ranking varies a lot. He appears to have closed out some decent projects, and started a crop of bad ones—though it should be noted, the year-to-year variance in these evaluation scores is not huge, not to mention that it's entirely unclear how much influence the World Bank president has over the quality of project execution. 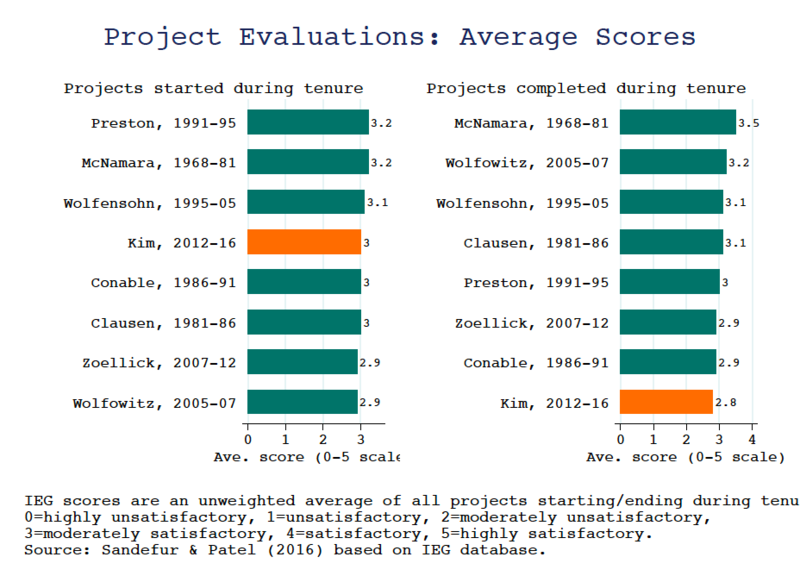 Judging Jim Kim using project evaluations is even trickier. Scores are only available for 33 projects that started (and ended, triggering an evaluation) during Kim's tenure, compared to nearly 600 for his predecessor Bob Zoellick, and over 2,600 for the long-serving Robert McNamara. That means the projects are likely to be of a different type as well—dominated by what used to be called structural adjustment loans, designed to spur policy changes rather than to build stuff. Nevertheless, using this small sample of projects, Kim falls right in the middle of the pack on quality. Looking at projects that have closed out since Kim took office, the sample is quite a bit bigger, and the picture is a bit bleaker. That yields a sample of 585 projects, for which Kim ranks dead last on the evaluation quality metric. Again though, this may be unfair to Kim: as our colleague Scott Morris pointed out to us, some of this may be due to poorly designed projects that were rushed through during the 2009-2012 lending boom and are finally getting evaluated under Kim’s tenure. For an institution that evangelizes for evidence-based decision making, the debate over the selection of the World Bank's next president—and whether to re-elect Jim Kim—has been oddly devoid of hard data on performance. Data isn't everything. As Lant Pritchett has argued, it might be a good idea on principle to elect a woman for a change. And Kim is the twelfth consecutive American to run the World Bank, which is increasingly hard to justify as the U.S. share of the global economy declines. In short, if the United States wants people to treat Jim Kim's presumptive re-election as legitimate, it needs to lay out the case for him on merit. Even though the data is ropey, the onus is on the Bank's board, and especially the American delegation re-nominating Kim, to be explicit about what metrics they’re using to define success. Disclosure: Justin is married to a World Bank economist. However, she disavows all views expressed here and would prefer he stop writing about the World Bank. Note: All the calculations in this piece are based on World Bank data and reports. In some cases, we dug through decades of financial statements. Readers interested in replicating or modifying our rankings can download the full the data, including source documentation, and Stata code.